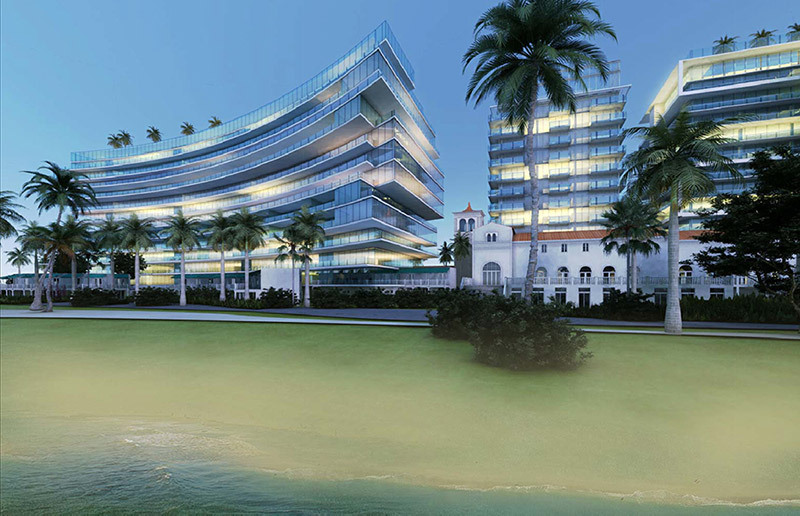 The Surf Club consists of three towers rising 12 stories above a single-story podium. The South Tower consists of 75 single-story custom residences and 5 two-story deluxe penthouses, each with a private landscaped deck and pool on the roof. Between the South and North Tower is a Four Seasons Hotel with 72 guest rooms. The North Tower consists of 65 single-story residences and 4 two-story penthouses, also with private rooftop pools and decks. The lower levels of the towers include spas, fitness centers, and other amenities. 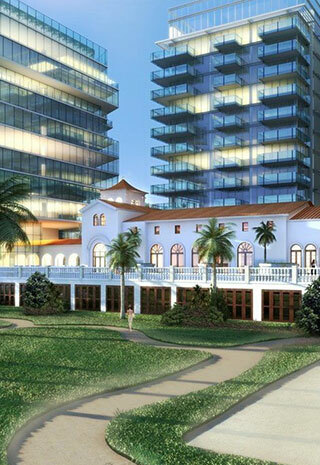 The hotel lobby, restaurants, and public spaces at the ground level are contained within the restored Surf Club. The highly exclusive original club was enjoyed by celebrities and political leaders including Winston Churchill, as well as business leaders of that era. The new project includes opening the historic club to the general public for the first time, allowing all to experience an elegance and grandeur of days past. In addition to these public spaces, the project also includes several private cabanas in two curving structures designed to replicate the original cabanas of the historic club. 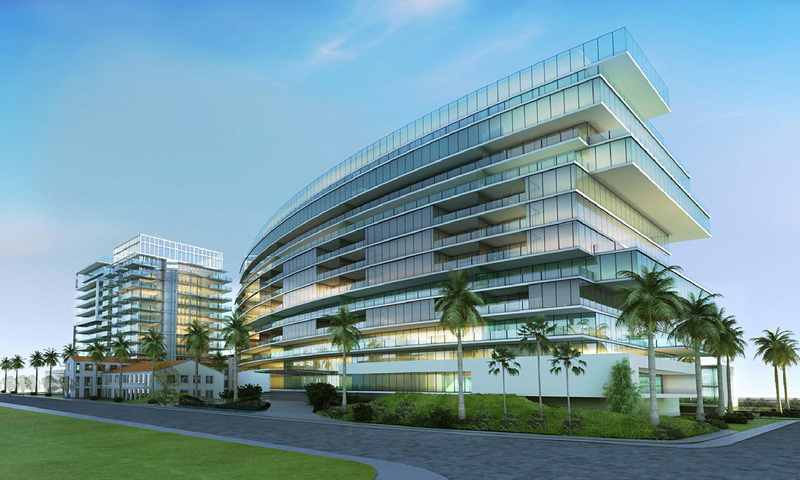 Building the new Surf Club towers that extend over the historic buildings provided several significant challenges to the structural design, and required innovative structural solutions. In addition, an entire basement for parking and back of house functions was constructed below ground level, requiring new structural support to replace the foundations of the historic buildings. At the north end of the South Tower, the bottom 3 floors do not extend to the ground. As a solution, a concrete transfer mat was built at the fourth floor to support the columns that carry the 9 levels of slab above. This elevated mat is supported by a single, large column that tapers in length. The elevated mat is post tensioned with bonded tendons and ranges in thickness from 6ft at the column to 3ft at the tip. The tendons were stressed in stages as the construction of the levels above progressed. At the east and west sides of the hotel tower, the new structure was required to pass over the top of historic buildings, with the first full floor located at the 5th floor. The structural solution was a double cantilever, post-tensioned transfer mat. The elevated mat is supported by the stair and elevator core at the center of the tower, and varies from 6ft to 2ft thick. Because of the large cantilever spans, several walls above the mat were designed to assist in carrying the 8 levels above. The bonded tendons were stressed in stages and shoring remained in place until 4 levels of structure above the mat were constructed. The southeast corner of the North Tower also extends over historic buildings below the 5th floor. At this location there was not sufficient vertical space to build a transfer mat, so a different solution was applied. At the roof, two large girders were installed, with a building column hanging from the end of each girder. Each girder is 7ft deep ranging from 4ft to 5ft wide with a cantilever of 21ft. The girders and the hanging columns are post tensioned with bonded tendons. At the ground level, an extensive series of steel beams was installed to support the existing building walls and columns, and to carry the loads to new concrete columns strategically placed for the parking layout in the basement. Extensive temporary bracing was installed during construction to protect the integrity of the existing walls. These existing walls were strengthened by installing new vertical reinforcing. The foundation for the towers consists of augercast piles typically spaced 3 diameters apart and connected together with pile caps. For the locations adjacent to the historic buildings, there was not enough room to install the required number of piles with the same spacing. This was solved by grouping the piles in clusters and extending them deeper, following the recommendations of the geotechnical engineer. In locations directly below the historic buildings, there was not sufficient vertical head room to use a conventional drill rig. At these locations, supporting only one or two stories, micro piles were installed. In order to maximize the owner’s return on investment, while preserving the historic heritage, the project team found innovative ways to utilize the space above the historic buildings. For both of the major post-tensioned transfer mats and for the overhead girder and hanging columns, a design-build approach was utilized. The post tensioning supplier and contractor collaborated with the structural engineer of record to design these elements with bonded tendons. Bonded tendons are not commonly used in conventional slabs and beams for buildings, but they are very common for bridge and other major civil works.